I call them the Good Mom Olympics. You probably know what I mean—the competition between mothers. It runs rampant these days. The competition begins at pregnancy, when mothers compare weight gain, Lamaze classes, and “birth plans”. That’s just the warm-up. The real competition includes babies’ sleeping patterns, teething, and walking. Soon mothers compare preschool readiness, elementary school achievements, middle school activities, and college admission letters. I’m a reluctant participant in the Good Mom Olympics. My friends are, too. In fact, I know few mothers who enjoy comparisons. But we engage, either outwardly or secretly, because motherhood has become more than a lovely addition to our lives. It’s become a measurement of our worth. We’re to be a Good Mom, and wear that label like a badge of honor. Christians have their own subset of the Good Mom competition. Much of it revolves around schooling. Christians believe that the Good Christian Mom homeschools or, at the very least, enrolls her children in private schools. Non-Christians believe that the Good Christian Mom teaches the Bible on Sunday, then sends her children to public school during the week so they’re exposed to different viewpoints. The longer I’m a mother, the more I resent the Good Mom Olympics. Who enjoys these games, anyway? Not my friends. Not my Christian sisters, either. While many of them homeschool, they don’t judge my decision to send my children to public school system in which I teach. Nor do I judge their decision. Homeschooling is a largely successful undertaking. It would be difficult for any naysayer to refute the positive statistics surrounding homeschooling. I think a few stern judges run the Good Mom Olympics, and they put pressure on us all. For whatever reason, they enjoy making women second-guess themselves. As if mothering weren’t difficult enough, they instill doubt and fear. They abolish our confidence even when our children are godly, happy, and thriving. God trusts mothers with a weighty responsibility. Should that weight feel heaviest when God convicts us, or when others compare us? Should we trust our Christian sisters, or assess them with critical hearts and wagging tongues? We know the answer to those questions. So let’s give those judges the boot. When they hold up a score, let’s turn our backs. When they urge us to worry and compare, let’s laugh instead. Let’s mother for the One who gave us the responsibility, and the joy, of parenthood. Let’s look to Him first, and to our children and spouses second, to evaluate our success as mothers. How about it, reader? Would your mothering improve if you walked away from the Good Mom Olympics? So good to see you, Gwen!!! I don't know if my mothering would improve by withdrawal from the good mom olympics, but by golly, I would sure have a lot more peace of mind! It's just so hard to pull your entry. So tempting to say, "Well, yes, I can see that your Jimmy is very athletic and smart, but at least my children are polite." Of course it isn't said quite like that, but it's what we really mean. We want our kids to be just as special as the kid belonging to the mom who is bragging about test scores and percentiles. Hooray Gwen's 'in the house'! It's wonderful to have you back and have more of your beautiful writing, as well. I think it's very difficult not to do this as part of the mom chatter. We mean to help or guide each other at times and new moms must learn to choose what works for them out of all the comparisons and suggestions they are exposed to. Unfortunately, like the myth of the clean house, we do judge ourselves on the successes of our children. I don't know if it's 100% wrong, because there are moms who don't care how well their children are doing either. You got my attention with the schooling question. (Hot button--expect a long response.) I've both taught in a private school, and then homeschooled my daughter. While I've had good experience homeschooling personally, one thing that really gets my goat (if I had a goat) is when parents who are ill-prepared and not entirely motivated, get goaded into homeschooling to prove they're good parents. I've seen cases that border-lined on neglect or abuse, and it just turns into a miserable experience for everyone. So much depends on the nature of the child and the skill set of the parents. When it comes to schooling, I'm definitely pro-choice. It's not one-size-fits-all. Another area of 'competition' I refused to be drawn into was the family size Olympics. I ran into a few families where the number of kids seemed to be some marker of spirituality. And my one child barely qualified me to be a parent--at least in their eyes. Don't get me wrong, I've met some very good parents who chose to have and successfully raise large families. But I've also seen people goaded into having "as many kids as God gives them, Amen?" only to find themselves overwhelmed while the kids ran wild. I think there are still things to learn from the Olympian analogy. Athletes don't compete in every event. The gymnasts train very differently from the weight-lifters. Why can't we applaud good parenting without trying to force everyone into the same mold? Hi Gwen! Love your profile picture! I am a mommy olympics wanna-be drop-out. It was bad when they were little, it's worse now that they are teenagers and make lots of their OWN decisions! If we were more secure in our own ability to raise our kids, and in God's ability to finish what He started in them at conception, we'd be less inclined to play those comparison games. As Paul (I think) put it, "Comparing ourselves among ourselves, this is not wise." Other than schooling, we do lots of untraditional things in my house. For example, we hardly ever have a meal at the table together. Most days, we're eating together in front of the TV. I know family experts will tell you how important that family-table-talk-time is, but not in my house. We're talking all the time. And we have tons of conversations about whatever we're watching. My ways may be odd and unconventional, but I ended up with an amazing son who's worth more to me than all the gold medals in the world! Being an only child sort of qualifies me to reenter this conversation. Like Niki, I knew exactly who was going to get blamed for anything that happened while I was playing...ahem. I learned a lot about that when I then had three children and was supposed to believe all THREE were innocent of wrongdoing. I teased my mom about how easy it was to have only one child. Niki, I gave my kids a lot of freedom to make their own decisions. I can't second guess myself now. too late! Jen. TV? you bad mom. You and Billy have a super relationship and he IS a great kid. Your whole family gets the gold medal! Gwen! It's great seeing you! Love your pic and I so appreciate the post. Homeschooling is a worthy endeavor, but at this time, my husband and I have discerned that we are supposed to be engaged in our public schools. I have spent five minutes typing and deleting a bunch of stuff about the judgment I've received, but let's just leave it to a matter of calling. I encourage and support my homeschooling friends--our children's education and formation isn't one size fits all. I want to be a better Cheerleader, rather than a wrestler in the match of mom-olympics. Build up the body instead of nitpicking it. The really ridiculous thing about the good mom olympics is that you can't please everyone no matter what you do. I gave up on it long ago. However, I do delight in the accomplishments of my children. I figure God gets way more credit than me. I want to thank you all for your excellent feedback. You gave me much to think about, and I really appreciate your encouraging words! As I said, modern parenting comes with so much pressure--a different kind of pressure moms faced in the past, when it was good enough to raise a healthy child who could complete the tasks of living. Now, we deal with all the issues I listed above. And oh, yes, is schooling a hot issue among Christians! Susanne, I too have faced jugdment for choosing to retain my public school teaching job even though I'm a born-again Christian. But these kind of places--hangouts for moms both in "real time" and "online", are invaluable. Here we can forget the game-playing and learn from one another, and just enjoy one another's company. I'm surely grateful for that! God bless you all, and thanks for letting me chime in again! Hey there, Gwen! It's so great to "see" you. 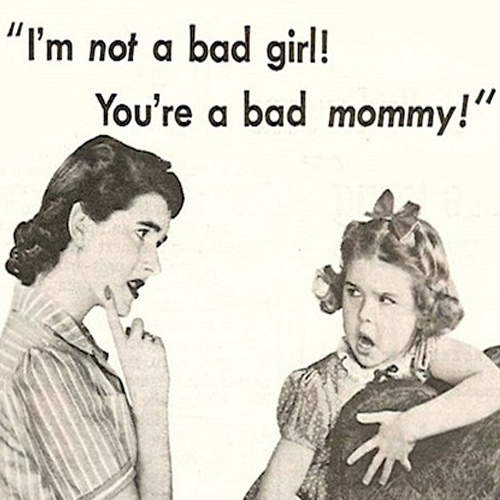 :) I had a little experience with those "good" moms when my son was little. I quickly distanced myself because I couldn't take the constant comparisons and I knew I was a good mom. Like Jen and Billy, Kirk and I have a wonderful close relationship and I'm so thankful for it. Interestingly, even when your kids are grown and out on their own, the "good mom olympics" continue. I hear it so often - bragging, comparisons, one mom or another being sneered at or taken to task for one thing or another. It's kind of sad. Thanks Gwen. Take care and come back again soon. i took notice that you received judgement for staying a teacher in the public school system. i think it's great that you're there. my brother lives in colorado and the schools in his area have so many Christian teachers in the public school system, they sort of joke that they've inadvertantly created "Christian" schools. so kudos to staying where you believe God wants you to be!!! !